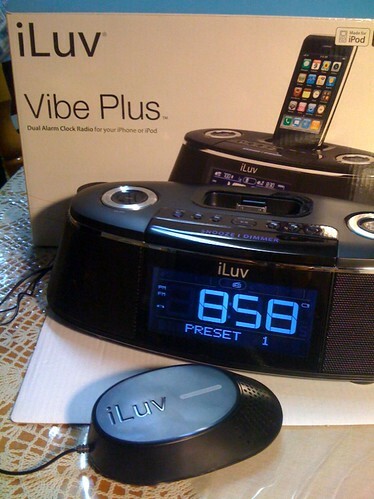 I first heard about the iLuv Vibe Plus Alarm Clock with Bed Shaker on TUAW’s website (iLuv iPhone dock includes “bed shaker”) and immediately placed an order for it on Amazon (product page) even though it was not released yet. After waiting about a month, I finally got it in the mail… My first impression: I love my new Alarm Clock! The first thing I did when I opened it and plugged it in was dock my iPhone on it and it automatically set the time and date on its own. My Mom thought it had it’s own atomic clock. – There is two separate alarms and each on has its own button to turn it on/off. – Using the wheel, you select the hour, then the minute. You can set it forward or backwards. – If you pick Radio, you can set the volume level. I didn’t actually get to see if the alarms wakes me up the first night because I woke up too early, since I have a lot of work today. This entry was posted in Techie and tagged alarm clock, iLuv, iphone, purchase. Bookmark the permalink.